Santa Fe’s Museum of International Folk Art has been among my most-beloved destinations for the 30 years I have lived in New Mexico. With the museum’s opening of an epic, yearlong exhibition devoted to food, nourishment, and cultural heritage, I am now so enamored that I might ask the staff to let me move into one of the galleries. 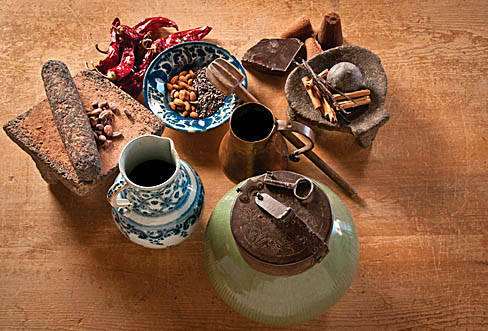 Five years in the making, New World Cuisine: The Histories of Chocolate, Maté y Más, is a must for anyone with an interest in culinary history, beautiful objects, and gorgeous staging. Nicolasa Chávez, curator of Spanish Colonial and Contemporary Hispano/Latino Collections, shows expertise and passion for her subject at every turn. She’s a 15th-generation New Mexican, with degrees and advanced degrees in history, Spanish language, and Iberian studies from the University of New Mexico. She has transcribed the letters of Don Diego de Vargas, and worked as a curator for the Spanish Colonial Arts Museum. It doesn’t hurt that she’s traveled extensively in Spain and South America, spent years in the kitchen with her mother, grandmother, and great-grandmother, and is the daughter of one of New Mexico’s most distinguished historians, Thomas E. Chávez, retired director of the state’s Palace of the Governors. Click here for the complete story and recipes featured in this month&apos;s Tasting NM.